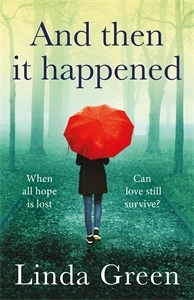 Today I’m taking part in the blog tour for Linda Green’s And Then It Happened, and I’ve got an extract from the book for you. According to Wikipedia, it was Aesop who came up with that line about familiarity breeding contempt. Which kind of vindicates my belief that Greek philosophers are, on the whole, rather overrated. I have known Adam for two-thirds of my life now. Admittedly, that’s only a dot backwards on the great history timeline of things towards Aesop’s era in 600 BC. But the fact remains that for me it is a struggle to remember life BA (as I tend to think of the years before I met Adam). There is a blurry childhood involving a one-eyed teddy bear, under-the-knee socks and grazed knees, blackberry-picking along the canal bank, a less than perfect ponytail and sticking my tongue out at my older brother Martin, who was always the apple of Mum’s eye. And then there is the day I started high school and met Adam. That is when life as I know it really began. We have barely gone a few weeks without seeing each other since that point. Yet far from make me look at him with a mixture of irritation and loathing, that familiarity has bred something deeper, stronger and altogether more wonderful than I ever thought possible. Don’t get mewrong, Adam is not perfect. He’s a man, for goodness sake. And this is a marriage not a fairy tale. There are, inevitably, a few things about him that cause me to roll my eyes and make the odd sigh or tut every now and again; he snores (though only when lying on his left side), appears to have a pathological fear of baths (I should point out in his defence that he does shower), refuses to go anywhere near a tapas restaurant (something to do with not being able to get one big plate of what you want to eat and having to go home and make cheese on toast afterwards because you’re still hungry) and is prone to going off on a bit of a rant if anyone expresses even the merest hint of admiration for either Margaret Thatcher or Tony Blair (perhaps the most excusable of his foibles). But that is as bad as it gets. A handful of silly little things that bug me. Nothing even approaching the foothills of contempt. Instead, I have all the lovely things that famil­ iarity brings: knowing that he understands when to back off and give me space and when to throw his arms around me and give me a hug; the fact that we can be comfortably silent together because sometimes we just know and we don’t need to say; the reassurance that if I have a headache he knows the exact spot on my shoulder where the knot causing it is and how to massage it away. And the fact that I know, as he sits opposite me at a rather swanky restaurant in Sowerby Bridge, top button of his shirt undone, brushing back the bit of dark brown hair which has always got in his eyes for as long as I have known him, exactly how he will respond to what I am about to say.